Janet Rogers trained at Reigate College of Art and was awarded a Surrey Diploma in Textile Design. Later, she worked for Heal Fabrics in London and then spent six years working as Art Editor at an Oxford publishers. At the Royal Academy Summer Exhibition, Janet was selected by the Financial Times as one of the most promising newcomers at the exhibition. She has held solo shows in France, her work is sold extensively in America, and it is held in many private collections internationally. Leading art printers have published limited edition prints of Janet’s paintings in the past, but she primarily produces originals now. Her most recent work is abstract, using mixed media and highly specialised techniques. Many of her paintings are richly overlaid with gold leaf in the final stage. 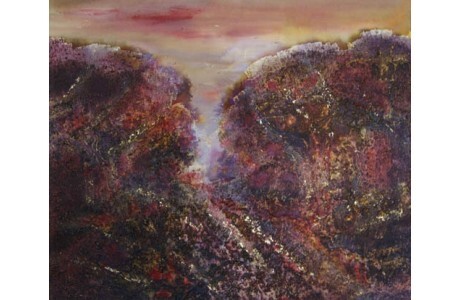 The techniques Janet uses are influenced by 19th century artist Samuel Palmer, such as mixing gum Arabic with water, applying it in layers and then varnishing. Each painting takes around a month to complete due to this complex, layering technique, which enriches her work and creates an almost sculptural effect. She has exhibited at the Royal Academy. Having lived in Belgium in the past, Janet currently paints from the studio in her home in Kent.